The Township of Manitouwadge uses CodeRED to send EMERGENCY notifications by phone, email, text and social media to keep citizens informed of emergencies such as evacuation notices, utility outages, water main breaks, fire or floods or other emergency situations. Please click on link for more information and to sign up! If you would like one-on-one help signing up or more information about the CodeRED Emergency Notification system, please join the Manitouwadge Volunteer Fire Department on the date below. Emergency Preparedness week in Ontario is May 6th to May 12th, 2018. 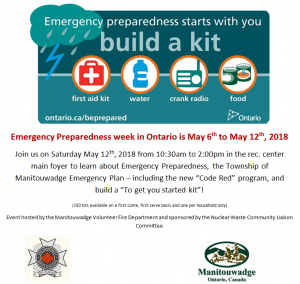 The Manitouwadge Volunteer Fire Department will be at the Community Recreation Centre on Saturday, May 12, 2018 from 10:30 am - 2:00 pm in the main foyer to teach Emergency Preparedness, the Township of Manitouwadge Emergency Plan - including the new CodeRED program and to build a "To get you started" emergency prepardness kit!